��ҳ�������� WebZIP 7.0.0.1025 �� 07/04/14 13:20:03. Fence netting are including wire mesh fence and post & pipe. 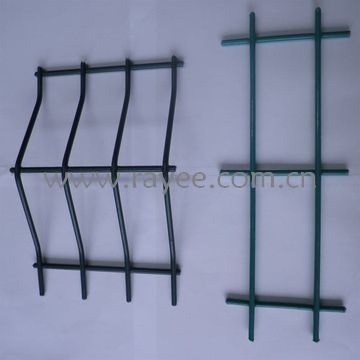 Wire mesh panel adopts the high quality dish as the raw material. Wire meshes are the welding panels through coated double layer. Wire mesh panel has the characteristics of anti-corrosion, aging resistance, sunshine resistance and weather resistance. Wire mesh fence netting can be kept for about 10 years not fade. Packing: iron pallet, special design with protection of damage. Characteristics: high strength, good steel natural capacity, wonderful shape, wild field of vision, easy to install, best weather resistance. The specification of mesh panel can be designed as your request, also mesh size can be designed as your request. Application: prevention for road, railway, airport, residence district, seaport, garden, feeding and husbandry.